I went outside taking pictures in my parent’s backyard this week and got a couple amazing pictures of the trees. 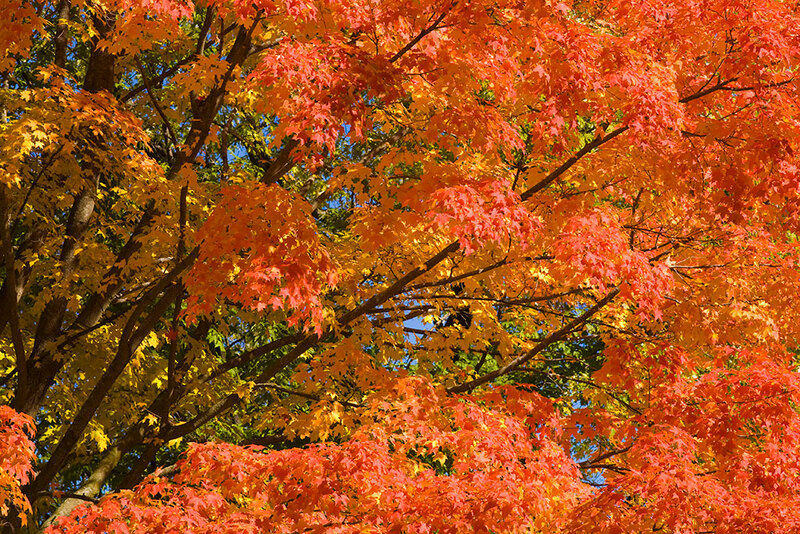 One in particular was just at it’s peak, displaying a gorgeous mosaic of greens, reds, oranges, and yellow- set against a deep blue sky. I went under the tree and pointed my camera up into the branches to get that nice blue background. And in another picture I wanted to capture the whole tree to show the color layers. 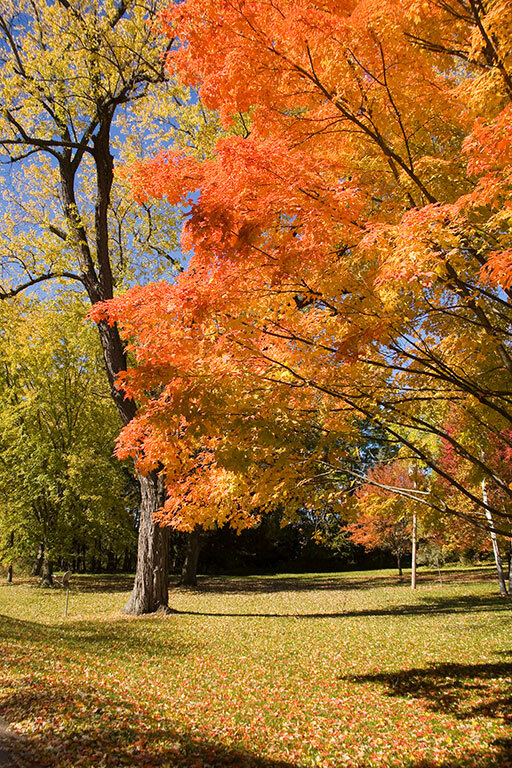 It’s kind of neat that trees start to change color at the top and gradually progress downward. Some trees I’ve seen look like someone uprooted them, flipped them over, and dipped them tip first into a can of orange paint, the bottom half still green. Pretty neat. It’s been great to be back in the Midwest for Fall this year. This will be the first time in a long time that I’m seeing the progression of the seasons. In years past we’ve visited during this time. But seeing Summer change to Fall, and pretty soon Fall to Winter will be fun. I don’t think I’ll ever take the beauty of the Midwest for granted ever again. You can see the color progression starting at the top and working it’s way down- red, orange, yellow, and green. What a display! Click here to see other photos from this collection. Still. That’s the one word I’d use to describe living in America so far. Still, no movement, and quiet. Like living in a picture hung on the wall. There’s detail and depth. Color and shadows. 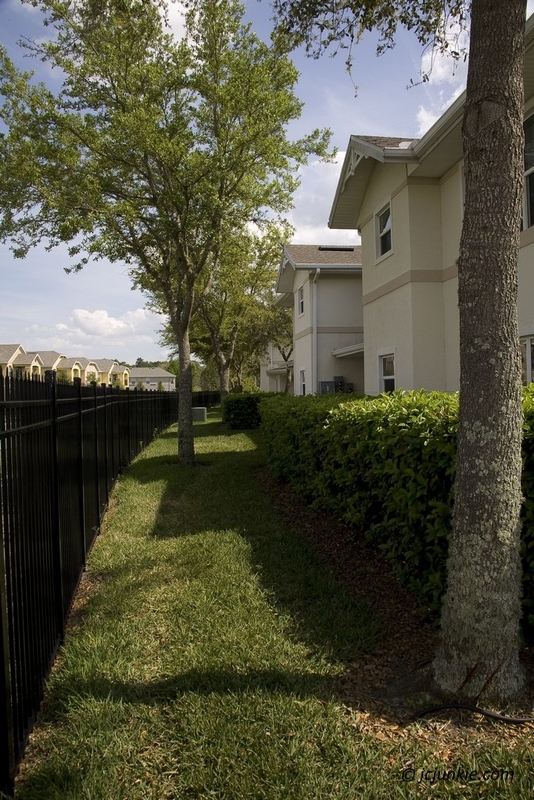 All around me I see manicured lawns, perfect sidewalks, brightly colored houses. Fences and sidewalks. Blue skies. Perfect. A beautiful scene to behold, but very little movement. It’s almost like it exists in slow motion. . . or even no motion at all. But then a bird will fly by. The wind rustles the leaves in a tree. A car drives by. And then I realize I’m not in a picture anymore. I’m in the real world. This place that looks like a painting is actually real! And here I am, living inside it. How did I get here again? I haven’t experienced peace and quiet like this in many years. I almost forgot what it sounded like. To be so quiet you can hear the creak in the walls- or pick out a sound in a room on the opposite side of the house. I forgot my ear could do that. My eyes too are taking in new sites. A rich tapestry of design and color. My eyes can’t quite make sense of it all. Everywhere I look is something beautiful and clean, perfect and quiet. How can this be? Does this place even exist? Or am I living in a perpetual picture? I’m a stranger in a strange and beautiful land. It’s home, but somehow far more picturesque than I ever remembered. I think I’ll stay for awhile. Kim and I had an awesome time in Bali. And really, this was one on the longest times we’ve been able to spend there- three weeks. It was an extended trip because we wanted to be there for Christmas, and then HAD to be there for an organizational retreat. So it made more financial sense to stay until our retreat was over as opposed to flying back home. It’s always a little surreal to come back to our home in BK after such an elegant and comparatively luxurious vacation on another island. As I’ve mentioned in numerous blog posts, it always feels like we step into a completely different world when we travel. Our life gets upgraded, and it feels strange. We’re not used to people making us breakfast in the morning. 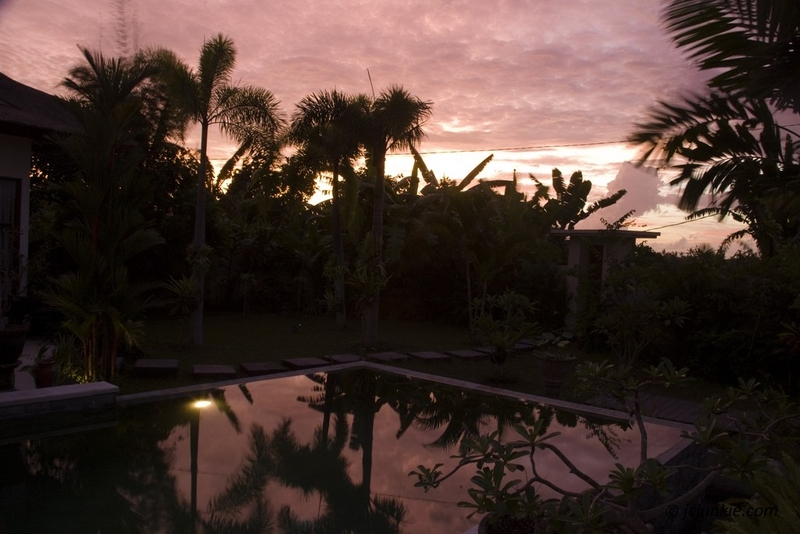 Or waking up to a beautiful sunrise over a beautiful rice field our villa window. Everything is manicured and cared about. We’re not used to that. Where we live it’s very ‘wild’. We have garbage and rubbish in our lawn. Goats and chickens roam our yard, oftentimes coming in the house. The other day I had to scare off a hen and six chicks who were in our house eating the cat food. Yes, pretty different. I’m not complaining. We chose this house and this lifestyle. And it has it’s benefits too. But when we travel and experience a different side of life we can feel the difference. Who are we really? Are we the rich elite who can afford expensive villas and fancy food? 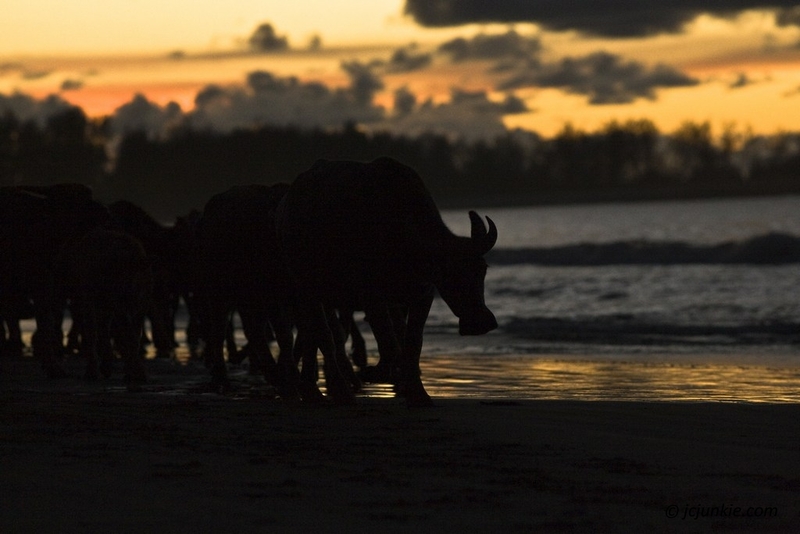 Or are we one of the locals, trying to fit into a very simple and primitive lifestyle? When the time calls for it we can do both. This is the view from the villa, out our front porch window. We had this private swimming pool all to ourselves for the week. Tropical paradise indeed! 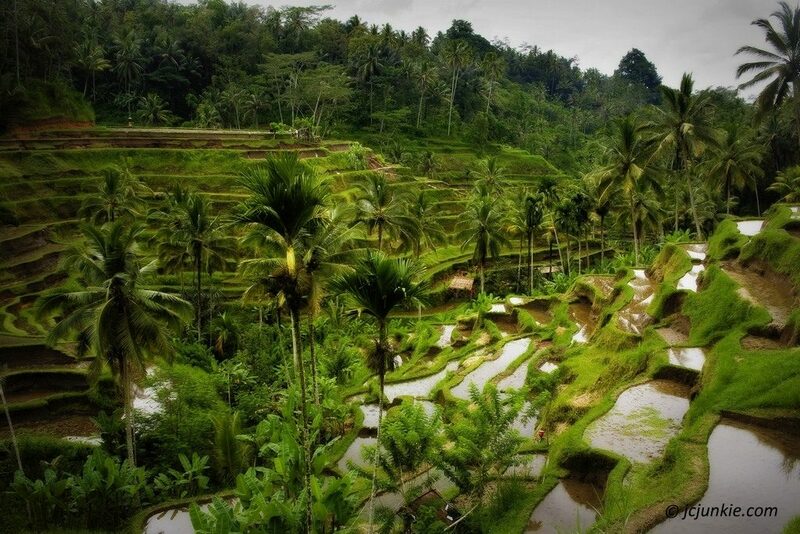 The rice terraces of Ubud, Bali. Green and beautiful- all the way down the mountain. 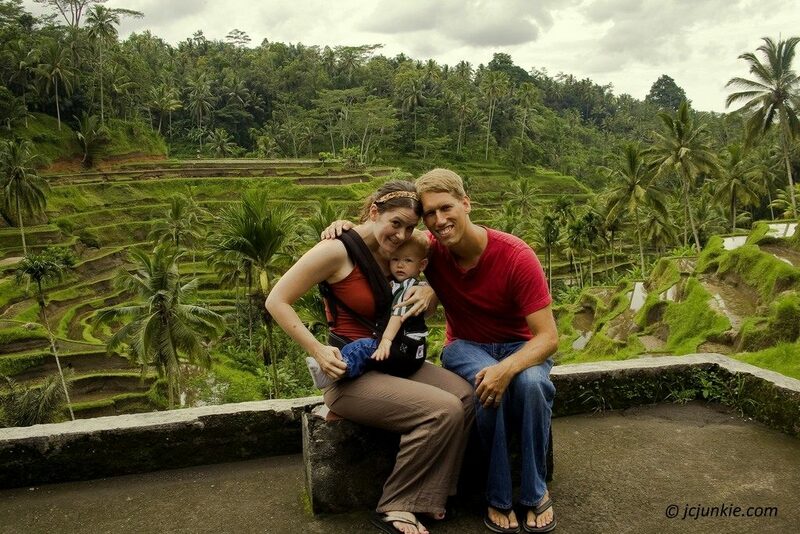 Kim, Eli, and me enjoying the sites in Bali. 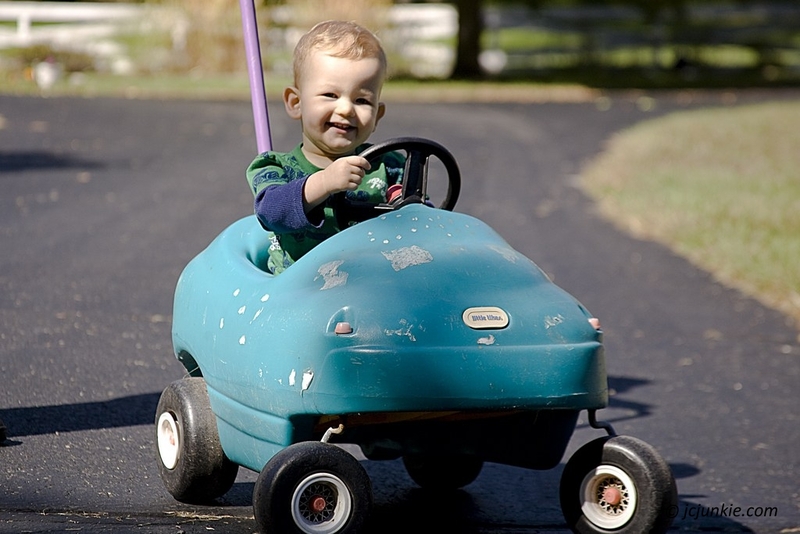 I recently joined the stock photography site iStockPhoto.com. I wanted a way to upload and sell some of my photos and this site seemed to be the largest and most reputable stock photography site on the internet. The process to join is pretty straight forward. You choose a category of submission, in my case ‘photos’. You read through their rules of submission and tips for uploading a good photo. Then you take a brief quiz on what you just read and upload three photos for review. If you pass the test and your photos are accepted, you’re in! Pretty simple really. I joined this service for two reasons. The first is money. iStock sells photos for anywhere between $2-$6 per photo depending on the size of the image, and from that I get about 15%. It might not sound like much, but it’s better than nothing and who knows, I might make a bunch. It’s worth a try right? Knowing what kinds of photos sell well will give me the extra little nudge I need to shoot some different things and become a more rounded photographer in the process. But more important than the money though is that submitting photos to a stock site like this will give me direction with my photography. This is the other reason I joined- to be a better photographer. All too often I find myself shooting the same kinds of photos like landscapes, portraits, beach scenes, etc. But my hope is that this will give me direction to shoot and explore other kinds of topics. Knowing what kinds of photos sell well might just give me the extra little nudge I need to shoot some different things, and become a more rounded photographer in the process. If you’re interested here’s a link to my portfolio on the site. I only have one image in there so far (primarily because it takes them forever to approve your submissions) but I hope to grow it with time. Check it out. http://jcjunkie.com/wp-content/uploads/2014/01/IMG_0323.jpg 765 1024 Josh http://jcjunkie.com/wp-content/uploads/2017/02/jcjunkielogo.png Josh2014-01-14 19:00:522017-03-02 16:53:33Photography for Sale! Recapturing Photography. Making Each Picture Count. I’ve been trying something new with my photography lately. You know on digital cameras how right after you take a picture it shows you a preview of what you just shot? Well, I went into my camera settings and turned off that feature. I don’t want to see a preview anymore. You might think that’s not such a big deal, but I have a suspicion it’ll make a profound impact on how I go about taking photos, and help me be the kind of photographer I want to be. Let me explain. Back in the film photography days each picture you took cost money. Those that have never used a film camera before can’t really appreciate this, but each click of the frame, each shutter press used up film, which had an inherent value to it. A roll of film cost $4 and if you had 24 exposures per roll thats about $0.16 a shot! It might not be much, but even just $0.16 makes a difference to your technique. It forced you to stop and think, to use your brain a little. Imagine that! All too often with digital cameras these days the tendency is to shoot first, see later. It’s so easy to pull out your camera, take a picture, look (or don’t), try again, put camera away. Or even worse- hold the shutter button down machine gun style as you take 20 pictures in rapid fire. The thought (if there is one) is that surely ONE of the twenty will be good. But really let’s be honest- all you get out of that is 20 bad pictures. Digital cameras and smart phones make it so easy to remove all thought from the process. But this isn’t the kind of photographer I want to be! I want to be creative. And with high end equipment you’re really doing yourself a disservice by not thinking a picture through. Photos are capable of being so much more! Reversing the order will train myself to see the picture in my head before I see it on a screen and inject value again into each and every picture I take. That’s why I’m trying to change the way I take pictures. Instead of shoot first, see later I want to SEE first, shoot later. Reversing the order will train myself to see the picture in my head before I see it on a screen and inject value again into each and every picture I take. This is how you used to have to do it in the film days. You didn’t have a choice. And maybe we took fewer photos back then. No doubt! (look at Flickr- 60 billion new photos every month) But the photos we took back then were better- more thoughtful. And it can be that way today too if we try. I want to recapture the creative aspect of photography. And I’m hoping that by making some slight changes to the settings on my DSLR I can get more value out of my pictures. http://jcjunkie.com/wp-content/uploads/2013/11/buffalo_on_beach.jpg 684 1024 Josh http://jcjunkie.com/wp-content/uploads/2017/02/jcjunkielogo.png Josh2013-11-28 20:00:152017-03-06 15:28:37Recapturing Photography. Making Each Picture Count. We’ve really enjoyed our time in Wisconsin the past couple weeks. The weather has been just beautiful and just about everyday we’ve been out taking walks enjoying the delightful breeze and scenery. Eli’s been taking in all the new sights and sounds here on the farm. Everything from swings, to trees and grass are all new to him and he’s been enjoying every minute. 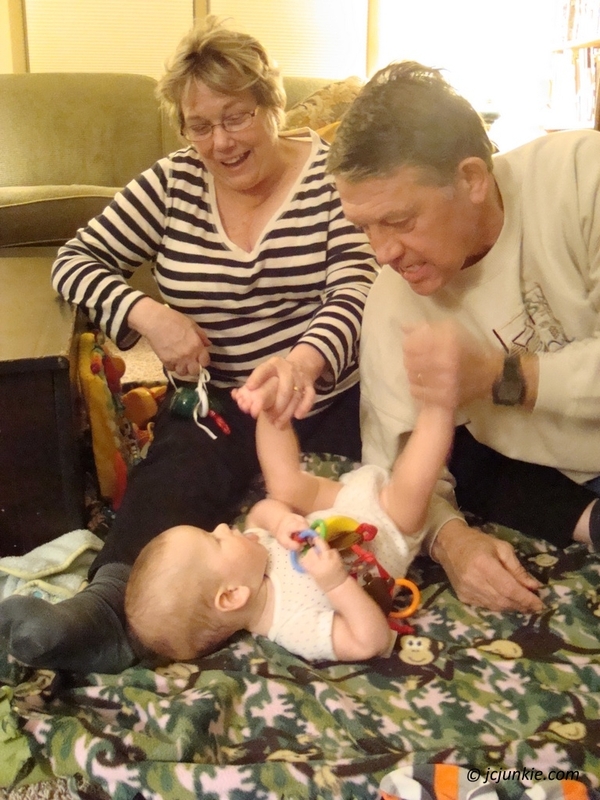 And of course grandpa and grandma have been more than willing to watch him giving Kim and I a much appreciated break. It’s fun to have a little time to ourselves again, just the two of us. We couldn’t have asked for a better couple weeks to visit. Here are a few pictures I took recently. My parent’s barn looking right at home in the country. 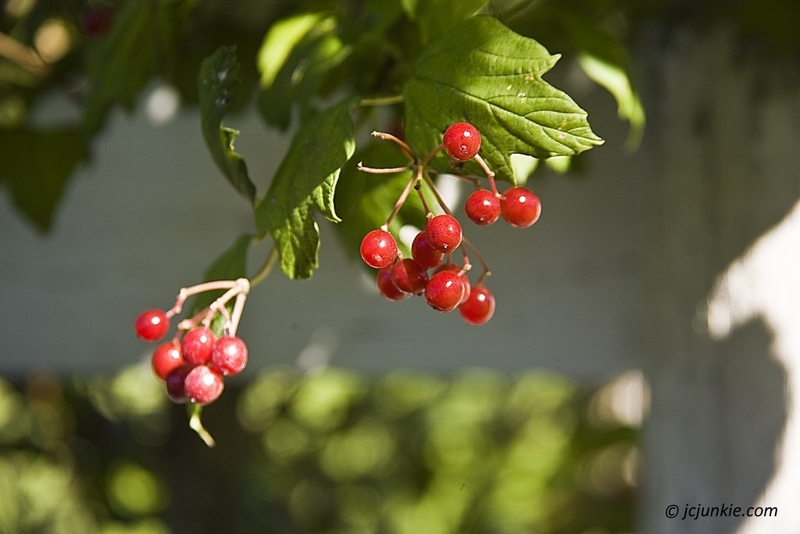 High-bush cranberries on the vine. Yum. Eli’s first birthday, and lovin’ his cake! Haircutting Ceremony In Our Backyard! Kim and I participated in an event in our neighborhood called an Aqiqah or ‘haircutting ceremony’. When a baby reaches a certain age, somewhere between 40 days and four months, a party is held to celebrate the new life. It varies when this celebration is held, but usually after the baby is healthy and deemed survivable. Our neighbor’s baby turned three months and so she held an Aqiqah two doors from our house. Kim was invited to help with the cooking a few days beforehand. 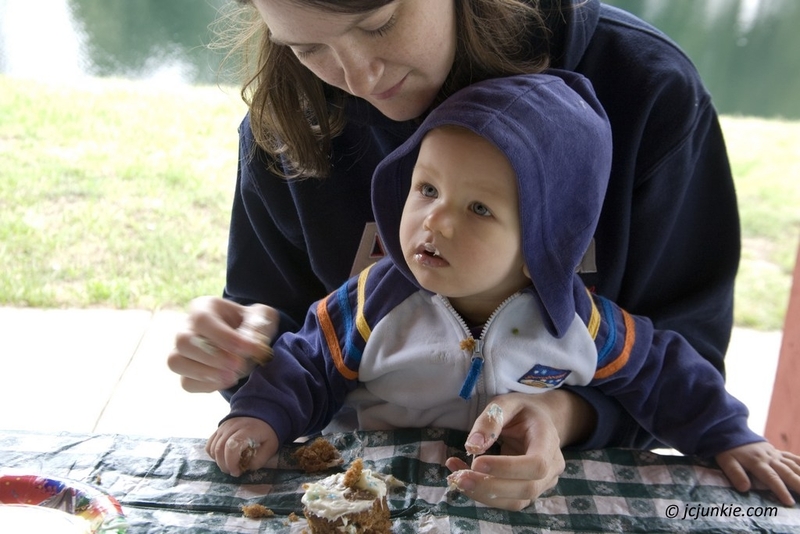 The women in our area are stay-at-home moms so they relish the opportunity to get out and cook with other women. It breaks up the monotony I suppose. A space was set up in the backyard. 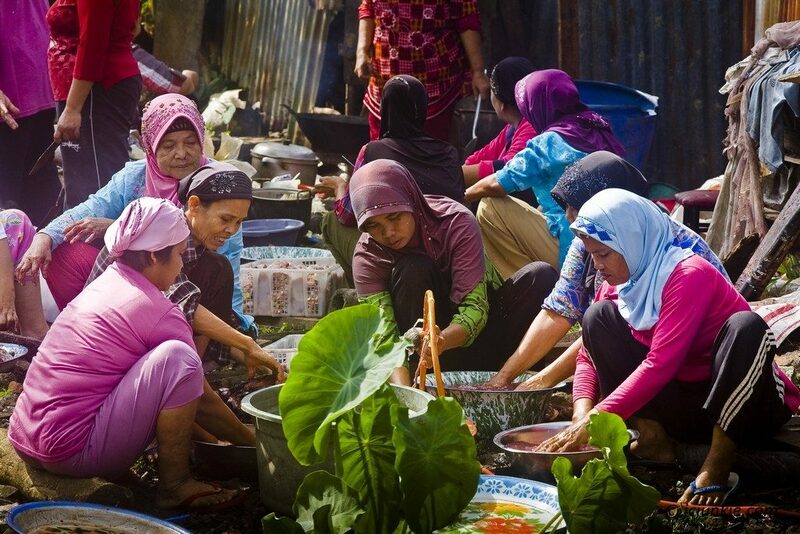 Even though it’s hard work cooking over a fire in the hot sun, the women got all dressed up for the occasion. It was quite a site to see. I took several pictures of the women in action from our house. 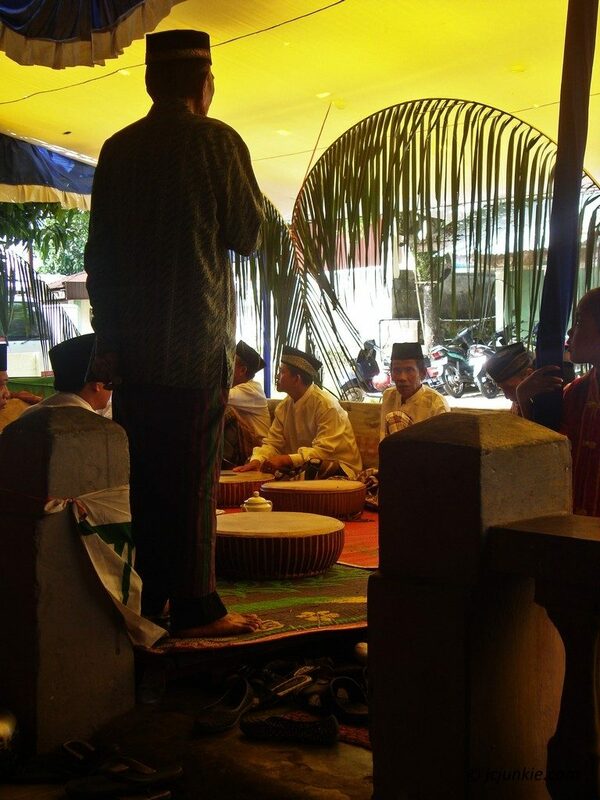 The ceremony began around 8 am with a drum group called ‘bedikir’. You can hear the ‘dhong dhong’ of the drums from a ways away. This is considered ‘traditional entertainment.’ Even though there are modern forms of entertainment, like DJ’s and loud music, on the outskirts of town they still appreciate the traditional forms. 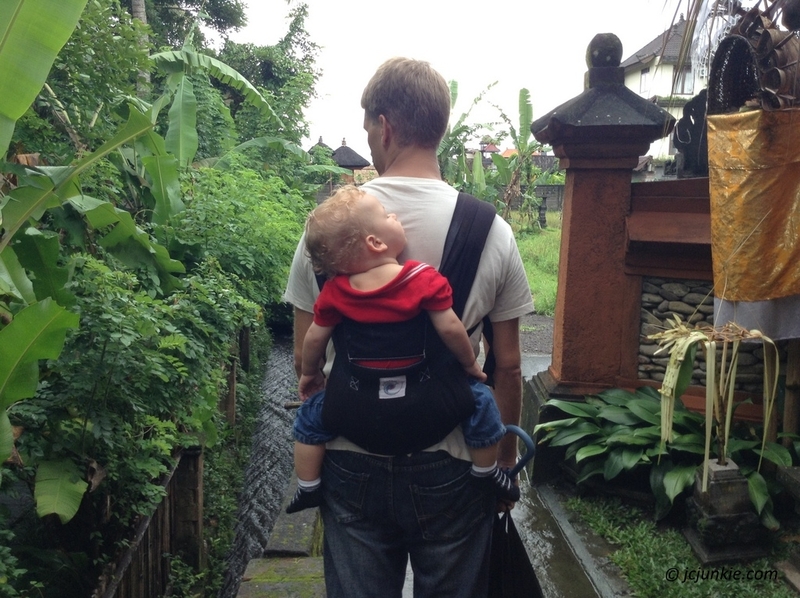 Roughly around 9:30 am (time is not a fixed thing in Indonesia) it was time to get started. Enough people had showed up, the seats were mostly full, and a member of the household stood up to welcome everyone. He greeted the honored guests, gave a rundown of events, and then said a prayer in Arabic. Arabic is a formal ‘religious’ language not typically understood by most people. They memorize and recite prayers in Arabic, but that’s about it. The drum group also sings/chants in Arabic. What happened next was a little bit of a blur. Everyone started eating at the same time and the mother and father started walking around as people cut snips of hair off their baby’s head. It was a little hard to know where to be. 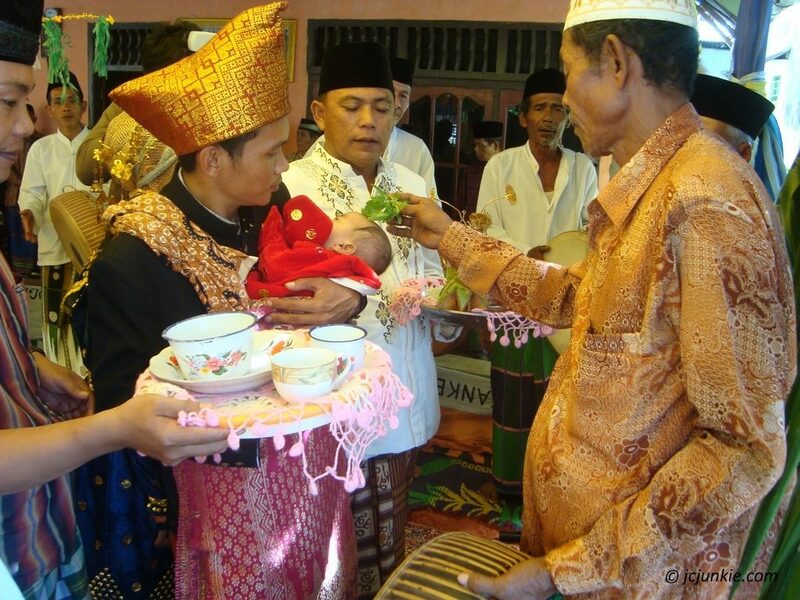 The haircutting takes place by carrying the newborn baby in a circle while respected elders and people from the family cut a little strand of hair from the baby’s head and put it in a coconut husk. They also take some leaves from a bowl and touch the baby’s head while speaking a blessing. Later the father and mother receive advice and prayers from an elder. From what I could understand the prayer consisted of asking that the child would grow strong and healthy, be protected from evil spirits and the devil, and be a faithful and strong member of the community. They also put the baby in a swing and rocked her seven times. We asked people what the significance of ‘seven’ was (why seven times) and so far all we’ve gotten is that they’re supposed to do it seven times, and to do any more or less would break tradition. Obviously we need to investigate this more. Food is arranged on a couple tables buffet style. They always serve the same four or five dishes- cooked beef (called rendang), a salad (called gado gado), a vegetable soup, a spicy chip dish, and fish. All of this gets mixed over the top of rice and is really quite tasty. With food, prayers, and the hair cutting out of the way people started to leave. Indonesian parties are usually pretty short, anywhere from 45 minutes to 2-3 hours at most. Since we were neighbors we stayed a little longer, which was okay because it allowed me to get more pictures and ask questions. 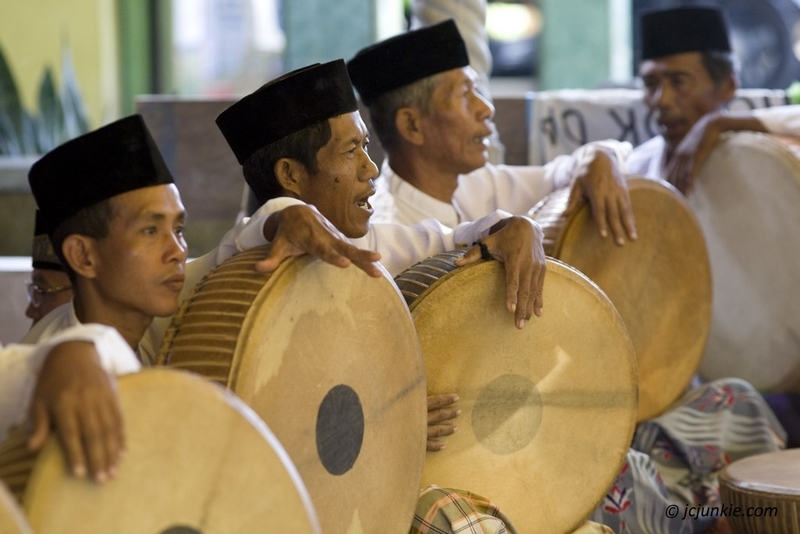 Neighborhood events are a very common part of our life in Indonesia. They make the community come together. 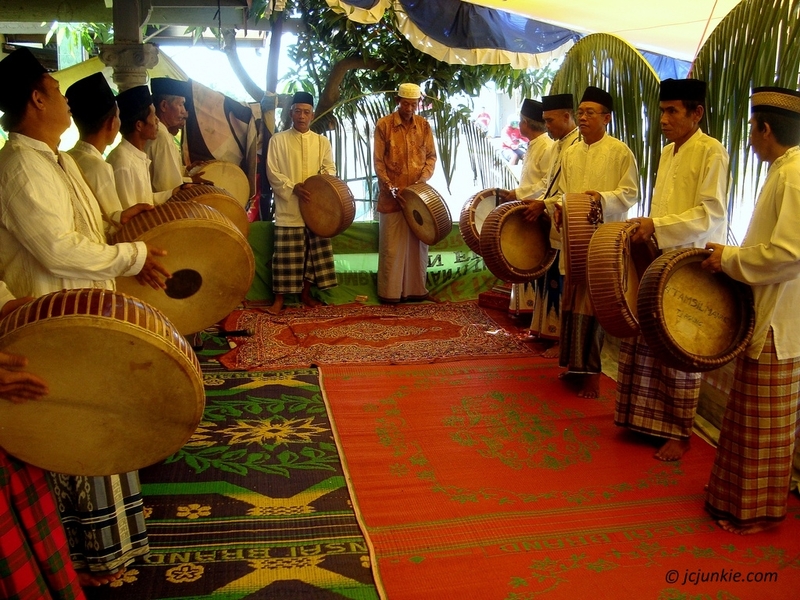 And now that Ramadan is near we can expect a lot more ‘rendang’ and drums in our schedule! http://jcjunkie.com/wp-content/uploads/2013/06/chant.jpg 683 1024 Josh http://jcjunkie.com/wp-content/uploads/2017/02/jcjunkielogo.png Josh2013-06-28 22:00:262017-03-08 19:52:35Haircutting Ceremony In Our Backyard! 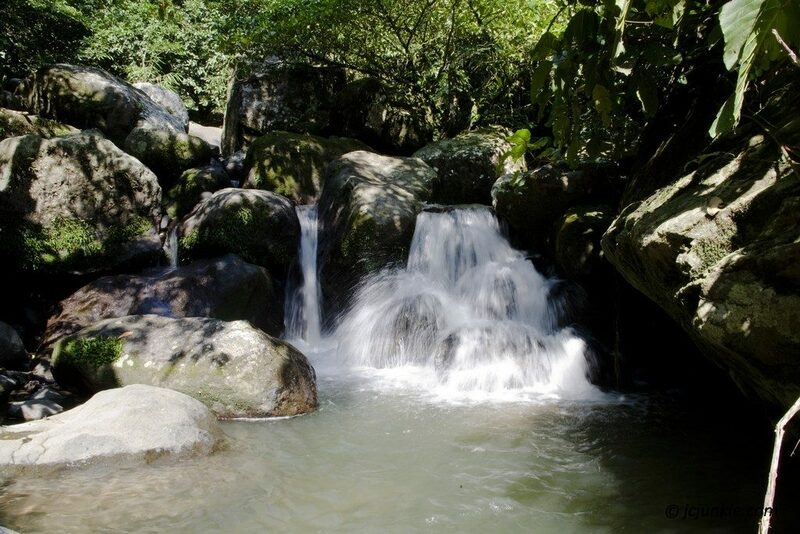 Last week some friends and I took a hike up a nearby mountain and swam in a waterfall. I really enjoyed the excursion. 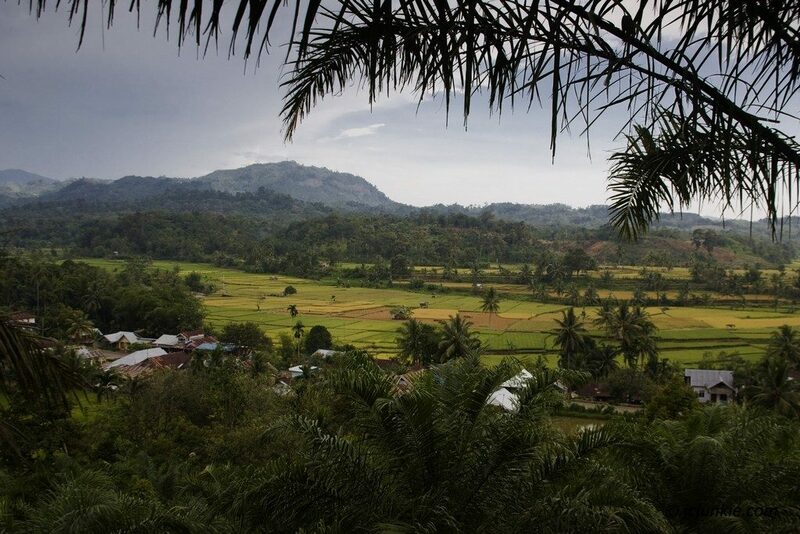 Something about village life in Sumatra always puts a smile on my face. The locals are always eager to accompany us up to the summit and swim with us. I want to give a brief overview of our trek, and I’m going to tell the story through pictures. So here we go. 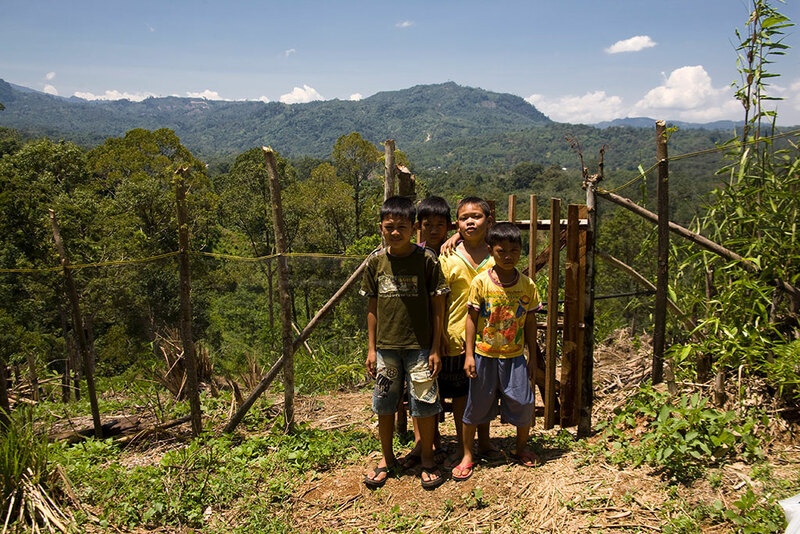 This first picture is a a few of the kids who followed us up to the waterfall. They live in the village down below. What strikes me about these kids is that I really doubt if they even asked or told their parents where they were going. I think what happened was we rolled up in our cars and motorbikes, a large group of white people got out, and we proceeded to start walking. When all the kids disappeared the parents must’ve assumed they all went with us. I mean, what else would the kids be doing? This is a shot of the “trail” we followed. This picture gives you the impression that it was downhill, but it was not. It was definitely uphill! 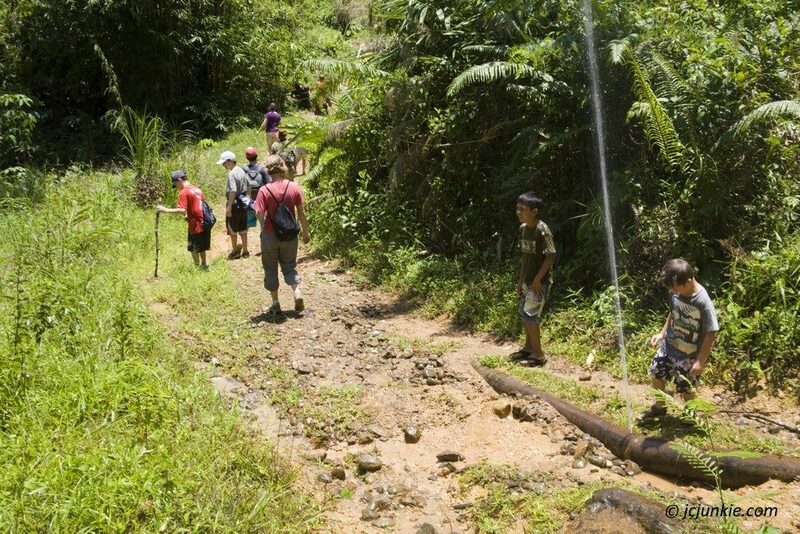 We actually followed a pipe that ran from the village to the river up top. The locals poked holes in it periodically to give off a spray for those traveling up the mountain. Good idea! We took a pit stop 3/4 of the way up by a little water reservoir. The kids couldn’t resist and jumped in. It definitely looked a little sketchy as there was a dam on one side and the water falling off the top. And that’s exactly where the kids were swimming, right at the edge! I think I’ll wait for the waterfall, thank you very much. This is a shot of one of the boys climbing up the ladder after jumping in. Finally, we made it to the top. The waterfall was spectacular. It was taller than I expected. It had a nice natural pool in front for us to swim around in, and the rocks on the side were just flat enough for us to climb on and jump from. 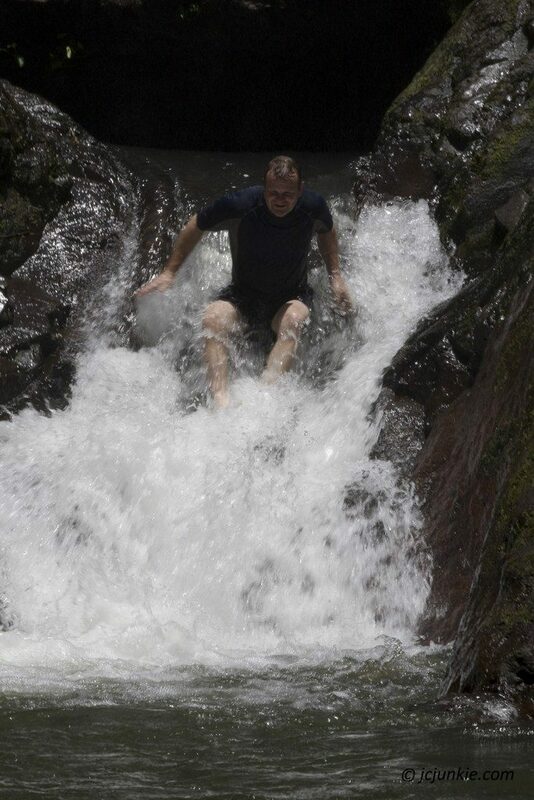 At the base of the waterfall was another little pool from which we could slide down from on our butts- a natural water slide! It was a little bumpy going down, but for the adventurous spirit a lot of fun. 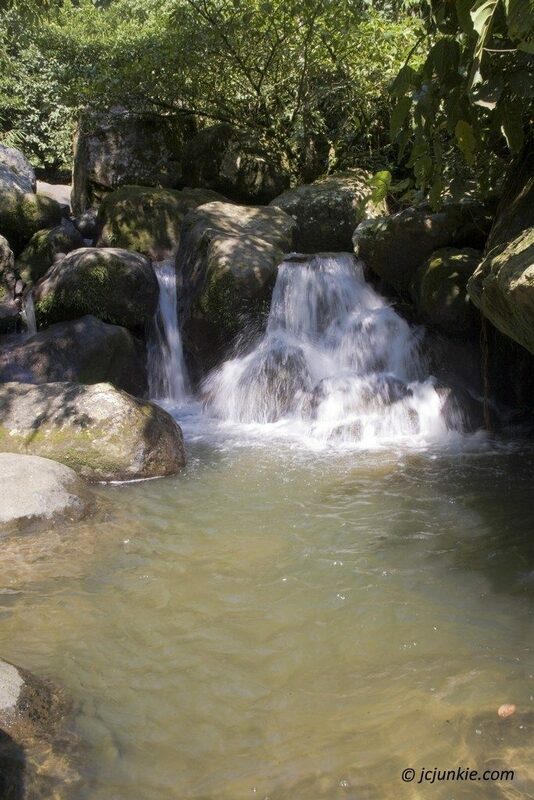 The water was pretty darn cold, but after a hot hike through the jungle it was very refreshing. Here’s a picture of the rocky water slide. Look out below! After swimming we ate a picnic lunch of the rocks. We ate ‘nasi bungkus’ or fried rice in a packet that we carried up with us. After stuffing our faces we washed our hands in the stream and took another dip in the water. I foolishly didn’t wear any sunscreen and someone pointed out that my arms and shoulders were looking a little red. The sun is brutal in Sumatra. I decided to rinse my shirt off in the water and wear that the rest of the day. After cleaning up the area and packing up our stuff, we headed back down, but not before noticing a really HUGE spider not far from our path. It very much resembled a Banana spider like the kind I saw in Florida, but I’m not sure exactly what it was. I didn’t really want to get a picture, or get too close for that matter. On our way back down the mountain I crouched by the stream and was able to get a couple neat shots of the flowing water. Lastly, on our way back home we passed by some beautiful villages and rice fields. We had to stop the car, get out and enjoy the scenery. Here’s a shot from atop the valley. All in all, a fun little excursion. 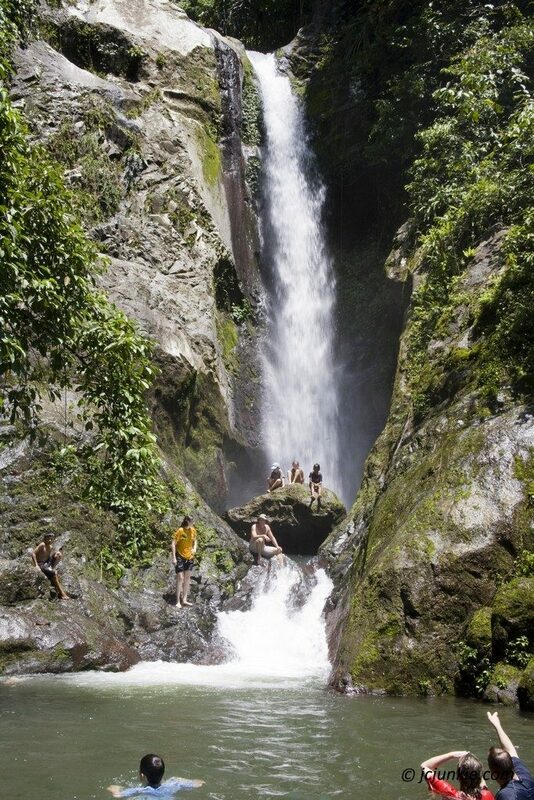 It’s fun to go hiking with friends, be followed by local village kids, and explore hidden waterfalls in the jungle. It’s been so fun to watch Eli grow and develop the last couple months. He is now over five months old. He’s been smiling so much more, cooing, and even giggling now. I never knew how much fun it could be to just watch a baby. I’ve always liked little kids. But having your own is exponentially more fun and entertaining. I’m just loving being a dad. Eli can reach out and grab things, talk and make noises back to you, follow you around the room with his head, and roll onto his belly for a better look. He’s even starting to get ticklish. Kim and I are trying to discover his tickle spots. =) Its been a real precious time with my parents too. We’re all feeling a little heavy with the thought of him leaving this place of comfort and love, but I’m optimistic this is a good start for his life too- being overseas that is. What opportunities we have. We made it up to Wisconsin just in time for the first snowfall. We came up Thursday and I think it snowed on Saturday, about three inches. It’s been so wonderful to be here again. I remember thinking last Aug, our first time back in about two years, that Wisconsin really did look nice in the summer. It was all so quaint and homey with all the farms, corn fields, empty ball diamonds, etc. Everything was so green. Driving by in the car was like the feeling you get looking at the Grand Canyon- it makes you smile inwardly, happy to be alive that moment. 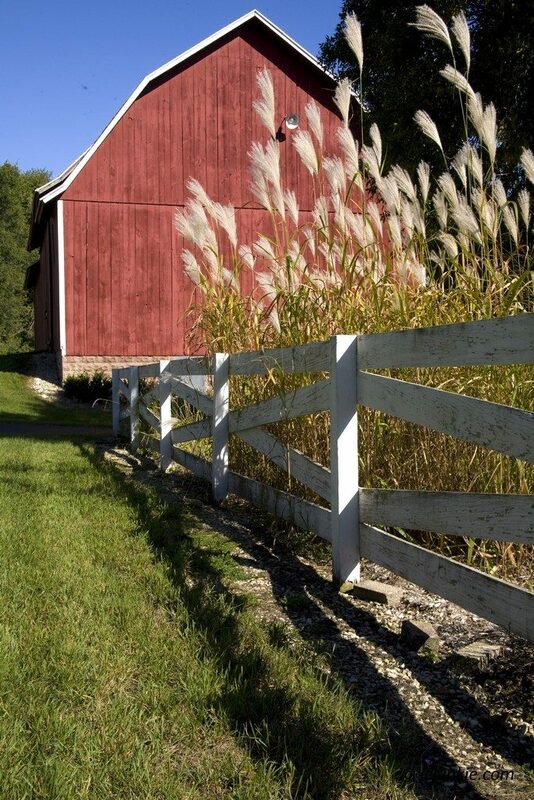 It’s funny how cows and barns can do that too. 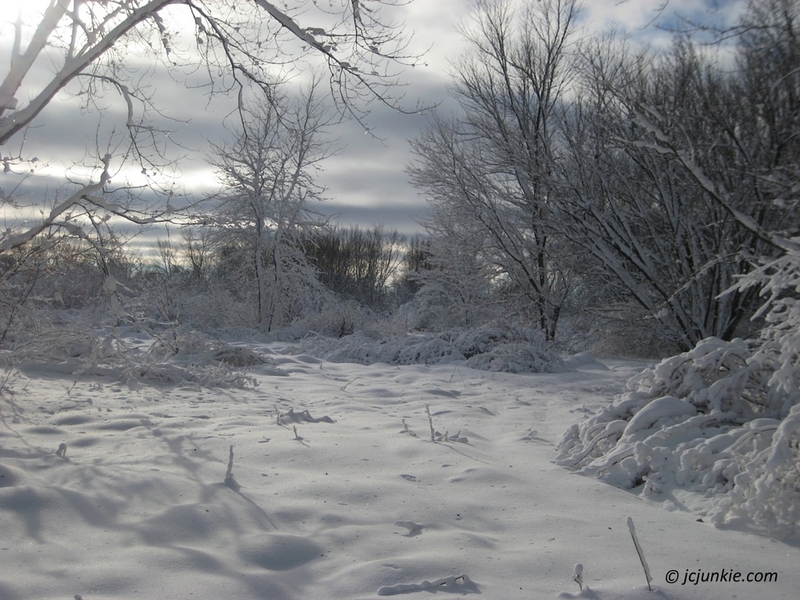 I’m enchanted all over again by the white and snowy landscape that I see all around me now in December. You have to understand that I DREAM of snow when I’m in Sumatra. Yeah, really! To say it’s hot over there doesn’t nearly describe it. It’s the kind of hot that seeps into your bones and makes your skin pasty all day long. You sweat from the inside out. It’s a draining , exhausting kind of heat. But to see this landscape, stand in a field and feel a chill run up my back makes me glad in new ways. I’m again at the Grand Canyon, eyes wide open, enjoying the beautiful sights and sounds around me. Here in Wisconsin it’s not so much what you hear, but what you don’t hear. The snow flecked trees, the carpet of white stretching out in front of me, steam coming from my breath. . . it’s completely SILENT. Yes, I’m enjoying the winter and will continue to do so. I know most people in Wisconsin feel differently about it. But for this one Sumatra guy, I can’t stop smiling. The most revolutionary act you can commit in today’s society is to be publicly happy.